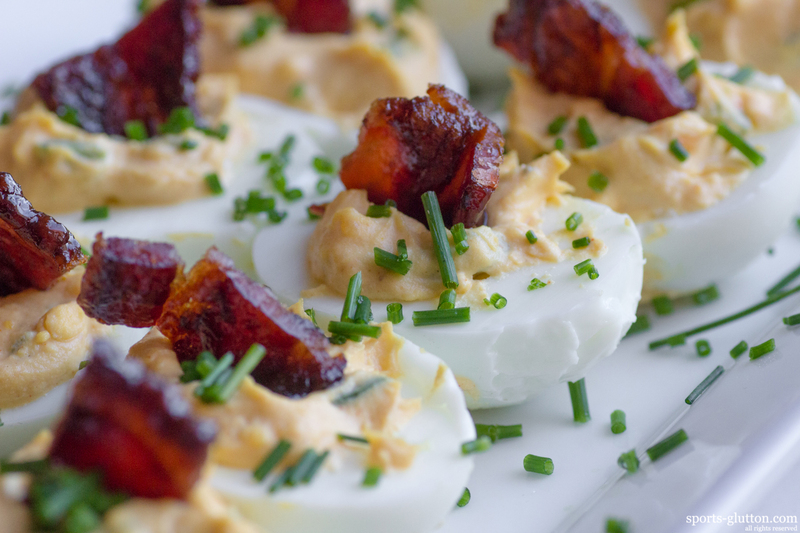 A little added bonus to a classic party favorite – Bacon Deviled Eggs. Bring a large pot half filled with water to a boil. Gently place the eggs in the water, being careful not to crack the shells. Cook for 10 minutes. Remove the pot from the water. Set aside to cool. While the eggs cook, heat a large skillet over medium-high heat. Add the bacon to the skillet. Cook for 3 minutes. Flip and cook for 2 to 3 minutes more, or until crisp. Transfer the bacon to paper towels to drain. Once the eggs cool, gently crack the shells and peel them. Cut the peeled eggs in half lengthwise. Scoop the yolks into a medium bowl. Add the mayonnaise, mustard, 1⁄4 teaspoon paprika, salt, and pepper. Stir to combine. Chop the bacon into small pieces. Divide into two equal amounts (about 1⁄4 cup each). Add 1⁄4 cup of bacon to the yolks. Mix well to combine. Place the egg whites cut-side up on a plate. Spoon an equal amount of the yolk mixture into each. Use the remaining 1⁄4 cup of bacon and garnish of course for the eggs, and serve.